According to US Geological Survey, landslides in the United States cause approximately $1-$2 billion in damage and kill more than 25 people on average each year. Worldwide, landslides cause thousands of casualties and billions in monetary losses every year. Researchers at UK’s Durham University recently reported that landslides kill ten times more people across the world than was previously thought. Their Durham Fatal Landslide Database (DFLD) showed that 32,300 people died in landslides between 2004 and 2010. Previous estimates ranged from 3,000 to 7,000 fatalities. One of the worst landslides and subsequent loess [sediment] flows on record happened in 1920 when the 8.5 magnitude Haiyuan Earthquake shook China for 10 minutes killing over 100,000 people. Although landslides and debris or mud flows are primarily associated with mountainous regions, they also occur in low elevations too. According to Science Daily some key landslide hotspots include China, the Philippines, Central and South America, and India, but slides can happen anywhere in North America too. 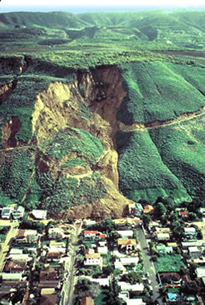 Landslides are basically masses of rock, earth or debris that move down a slope often triggered by many natural events such as earthquakes, floods or volcanic eruptions. 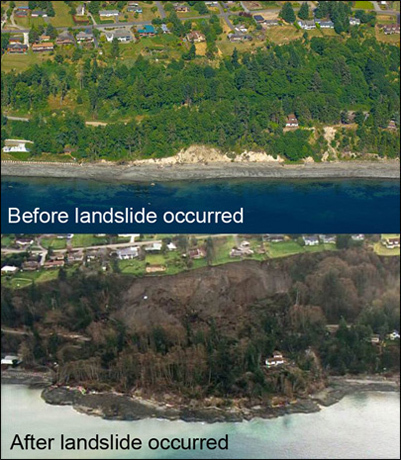 The term “landslide” encompasses five modes of slope movement: falls, topples, slides, spreads, and flows and can be further subdivided by the type of geologic material (bedrock, debris, or earth). Mudflows or debris flows (a type of landslide) are rivers of rock, earth, and other debris soaked with water mostly caused by melting snow or heavy rains creating a slurry. A slurry can travel several miles from its source and grows in size as it picks up trees, cars, and other things along the way. They can even move houses off their foundations or bury a place within minutes due to their incredibly strong currents. In addition to Mother Nature’s fury causing land movements, human activities like deforestation, cultivation, stresses on groundwaters, and construction on unstable land also play large roles. There are some warning signs to indicate if you have a potential problem. Recent fires? – Be aware that areas hit by wildfires have an increased risk of landslides and mudflows once the rainy season starts. Get insurance…? – Talk to your agent and find out more about the National Flood Insurance Program since mudflows are covered by NFIP’s flood policy. Be prepared to evacuate – Listen to local authorities and leave if you are told to evacuate. Where would we go? – Decide in advance where you would go in case you can’t return home for weeks or months .. or ever. If your home is damaged or destroyed or you’re forced to leave your home due to on-going threats (like mudslides or flooding), you’ll need to find temporary or permanent living quarters. This could mean staying in a public shelter or hotel, living with friends or relatives, or renting a home or apartment in the middle of all the chaos, so discuss several options now. Then, write down those options and share them with relatives and friends. Reduce risks – Plant ground cover on slopes and build retaining walls. doors and windows stick or cracks appear on walls, etc. Strange sounds – Listen for trees cracking, rocks banging together or water flowing rapidly (esp if near a stream or river) – debris flow may be close by. Move it! – Whether you are in a vehicle, outside, or in your home – GET TO SAFER GROUND! Avoid low-lying areas, washes and river valleys and look upstream before crossing a bridge in case a debris flow is coming. Listen – Tune in to local radio or TV reports to keep you posted on latest updates especially since other disasters like earthquakes, storms, flooding or volcanic eruptions may be associated with debris flows. Be small – If there is no way to escape, curl into a tight ball and protect your head the best you can. Listen – Local radio and TV reports will keep you posted on latest updates or check with your local police or fire departments. Don’t go there – Stay away from the area until authorities say all is clear since there could be more slides or flows. notice doors or windows stick, cracks appear, etc. Replant – Try to fix or replant damaged ground to reduce erosion, possible flash flooding or future landslides. Call an expert…? – Consult a professional landscaping expert for opinions and advice on landslide problems. Also call an expert out if you discover structural damage to home, chimney or other buildings. Consider having your house tested for mold. Remember… the more you prepare before disaster strikes, the better off you and your loved ones will be financially, emotionally and physically. You are currently browsing the archives for the landslide category.